Santtu Karhu & Talvisovat - "Hyvästit Karjala"
This five-piece band consisting of Santtu Karhu - Voc & Bass, Feodor Astashov - Guitar, Arto Rinne - Mandolin, Harmonica, Accordion, Backing Vocals, Igor Saharov - Drums and Aleksander Leonov - Flutes, Jouhikko, Saw, Backing vocals, explore the traditions of their homeland of Finland. They are said to be the only band in the world making music in the language of Carelia. Hyvastit Karjala is a very hard sound to explain even though I can hear things familiar. To start with, I can hear faint glimpses of Pink Floyd Animal’s time; I can also hear an Afro Celt Sound System style in the more traditional stuff. 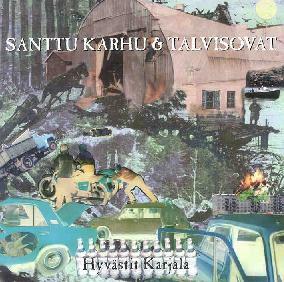 Santtu Karhu & Talvisovat produce a different selection of styles in their music to indulge in, you can hear Irish like whistle stuff in certain tracks, and there is a Fairport Convention element somewhere in here as well. It is a mix between folk type jigs and reels and more floating pieces, mellow and atmospheric. All lyrics are in Carelia so I have no clue as to what lyrical content we are dealing with, but that should not let you be put off. It sounds interesting as far as how they sing it. It is in a style similar to Covus Corax, and it is slanted towards tradition. I would not listen to it that often but possibly on occasion. It is produced very well and the sound is full and clear. I could only term it as happy music, music that would lift you up. It is the sounds of Finland twisted into "Ethnofuturistic Rock Music". That is a description by Santtu Karhu, and that will do me, I don’t know what it means but that’s how he sees it. For more information you can visit the Santtu Karhu & Talisovat web site at: http://www.talvisovat.ru. Hyvästit Karjala is distributed by Hot Igloo. You can visit their web site at: http://www.hotigloo.com.